InstantSign makes it easy to put your company name, logo or message on almost any surface. We can create an unlimited variety of labels and decals in various sizes and die-cut shapes - in large or small quantities. InstantSign uses vinyl, static, adhesive and pressure-sensitive materials to fulfill your signage needs. Whether you need labels and decals for property identification, P-O-P displays, advertising, packaging or even your company vehicles, our state-of-the-art computer technology enables us to fulfill all of your communication needs. 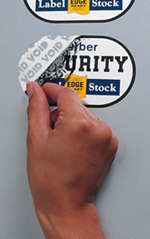 Contact the experts at InstantSign and learn how labels and decals can help identify, protect and promote your business.